Sandos Caracol Eco Resort is an all-inclusive hotel in Playa del Carmen, located on a beautiful, unspoiled white-sand beach. Designed for nature lovers and explorers, this hotel lies in the middle of a lush, green area at the edge of an exotic jungle surrounded by cenotes, mangroves and natural lagoons. 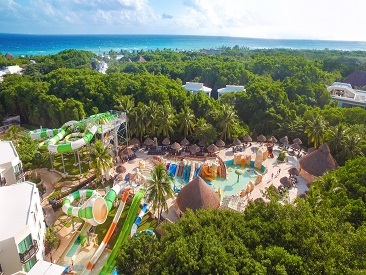 Perfect for family fun, Sandos Caracol boasts adventure options for children with a water park and a kids club, in addition to the myriad of amenities and facilities offered to guests of all ages. Sandos Caracol Eco Resort is an all-inclusive hotel in Playa del Carmen located on a beautiful, unspoiled white-sand beach. Designed for nature lovers and explorers, this hotel lies in the middle of a lush, green area at the edge of an exotic jungle surrounded by cenotes, mangroves and natural lagoons; an ecologically-rich environment for those who dream about a natural beach escape. 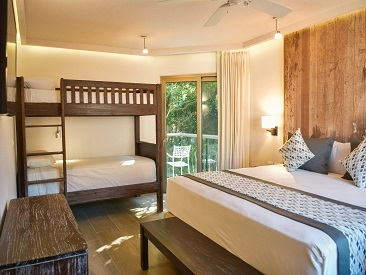 Sandos Caracol is a family-friendly hotel, offering adventure options for children with a water park and a Kid's Club. In addition, this Riviera Maya hotel boasts gorgeous gardens, delicious à la carte restaurants, tennis courts, nightclub and wedding/meeting facilities. For guests who love nature and animals and wish to explore the turquoise waters of the Mexican Caribbean, Sandos Caracol offers the perfect vacation destination. Sandos Caracol Eco Resort is excited to announce a new addition to their water park! There are now 12 brand new slides for kids, teens and adults added on to the 17 that the water park already contains! And the best part? It's part of the resort's all-inclusive plan! The water park features 29 slides and is divided into three areas: the Aqua Park for young children with 17 mini slides, a children's area with 5 slides and an area for teenagers and adults with 7 slides. Minimum height for the 5 new kid's slides: 1.10 meters / 3 feet 7 inches. Minimum height for the 7 teen/adult slides: 1.40 meters / 4 feet 7 inches. For the romantics, these informative activities are tied together with a Maya love story – guests can witness this love story unfold across three nighttime ceremonies every week in the resort’s most scenic natural locations. Additionally, a spectacular yearly event to celebrate the Day of the Dead can be experienced on November 1 and 2. The resort’s most beloved eco-activities will remain available separately from the theme tours, including: swimming in the Jade River, Animal Keeper, Eco Tours, Sensory Experience, swimming in the cenote, bike path, romantic boat ride, and underground Maya cooking. See the FACILITIES tab for information on each of these spectacular experiences. 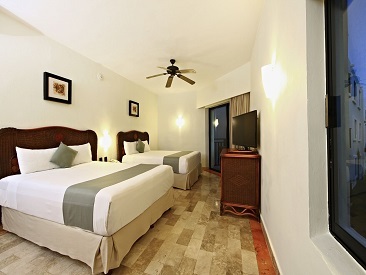 Sandos Caracol is only 45 minutes from the Cancun International Airport and just 15 minutes from downtown Playa del Carmen. A Green / Sustainable Property - Second Party Certified. Sandos Caracol participates in Travellife Gold, a second-party certification program. Second-party certification measures the property's impact on one or more of the following: environment, community, cultural-heritage and the local economy. An assessment of a company's sustainable tourism practices has been performed by an assessor or auditor that is not independent of the second-party certification program. Built around a natural ecosystem, the resort's dedication to low impact on its environment means the monkeys and tropical birds are right outside the door. Kids love it! Children are a definite priority at Sandos Caracol, which offers a Kids Club for games and crafts, and a program for teens that includes Wii and Xbox games. The Sandos Caracol complex also features a waterpark, specifically designed to give kids and families a thrilling aquatic experience! The Children’s Aqua Park comes complete with 17 slides, fun water features and a delicious snack bar, all surrounded by water spouts to make for a wet and wild adventure! - T-shirt for the bride and groom with the legend, "Just Married"
Sandos Caracol’s Select Club Adults-Only Rooms also feature the added bonus of an exclusive pool and Jacuzzi, complete with luxury sun loungers and free Wi-Fi access. This is the perfect amenity for those seeking a relaxing (and kid-free) dip in the water! Guests of Sandos Caracol Eco Resort are able to use the facilities at Sandos Playacar Beach Resort with a complimentary day pass! Please Note: There is free Wi-Fi in designated hotspots.